Our 5th annual Blue Sky Competition went off without a hitch! 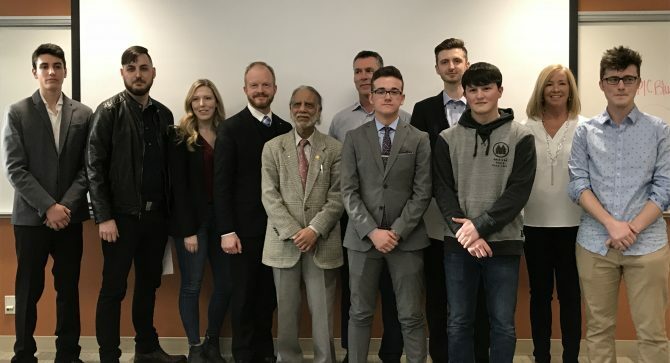 Current students from the University of Windsor and St. Clair College were encouraged to submit a 2-minute video showcasing how they can solve any problem. The goal of the Blue Sky Competition is to encourage students from different disciplines to work together to create solutions for real-world problems. It allows students to be creative while also developing their critical thinking skills. The main focus of the competition is for students to think about: improvement, innovation or inventing. On March 27th, over 40 people gathered to watch the semi-finalist video submissions during the Blue Sky Final Showcase. Eight semi-finalists competed for the Sushil Jain Tripe I Awards: First place = $1,500 Second Place = $750 Third Place = $500 Of the semi-finalists chosen, 6 of the 9 faculties at the University of Windsor were represented and 2 teams included both St. Clair College and University of Windsor students. Each video was judged on the following criteria: the problem being addressed, proposed solution, identifiable market research, team members, and quality of the video. The blue sky final showcased welcomed 5 judges: Dr. Sushil Jain, the award sponsor and current president of the South Asian Centre, Maureen Lucas, EPICentre mentor/ Entrepreneur in Residence, David Kirby, EPICentre mentor/ Entrepreneur in Residence, Andreas Waller, Business Development Manager for the Ontario Centres of Excellence, and Taylor Lanoie, Entrepreneur. Congratulations to the winning teams: First Place Grant Gauthier & Nick Schiller with their idea Drone Solutions: in-depth Real Estate tours using a drone, gimbal and DSR technology. Second Place Hayden Moon, Kenna Robb, Nick Kramer, & Johnny Wiebe with their idea Gladapt: an augmented reality app that provides light therapy, sound therapy and aromatherapy. Third Place Benjamin Graham, Victor Sam & Klaudia Rae with their idea Our.Care: an app to help distribute wait times at healthcare facilities.